What is your rain sensor doing? Posted on July 24, 2017 | by sprinklerman1 | Leave a Comment on What is your rain sensor doing? I have been to thousands of homes in my time in the irrigation business. I’ve seen wired and wireless rain sensors installed on new and old homes. I’ve also seen homes with no sensor at all. I ask homeowners that have a sensor if it’s been working for them. A lot of times they don’t know. It’s not their fault! More than likely, they forgot they had a sensor, were never told they had a sensor, or if they were told, that it ever needed maintenance. Wouldn’t it be nice to know that your rain sensor is working and that it’s activated? Well, Sprinkl Conserve does that. Once installed and connected to your Wi-Fi network, you can control the smart rain sensor from your phone app. And it works in principle like your old style sensor, except it allows you more hands on control and uses local weather data. The installation itself is straightforward for the do it yourselfers and the smart sensor can be installed into your existing controller! A professional licensed irrigator can also install it for you. The old style sensors were usually installed on the gutter or fence outside. 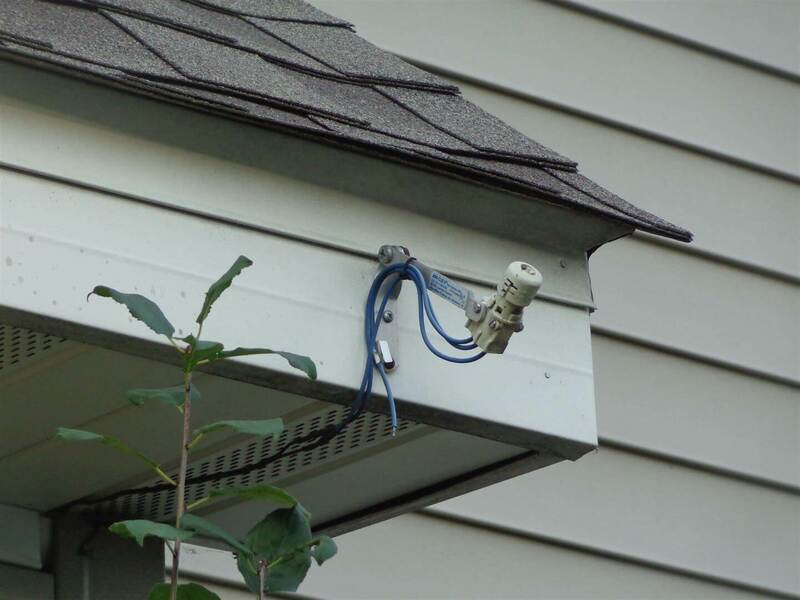 Those sensors were also susceptible to the physical elements of weather (hail), roofers, and fence repairmen. Those elements could break or move the moisture collector out of adjustment, moving it out of the way of rain and preventing it from working. The wireless versions of the old style sensors need batteries to maintain and replace every 3-5 years. And very few homeowners remember to check those or know when the batteries are low. The wired and wireless versions both need their moisture disks looked at every few years too. Debris, spider webs, and old age can keep them from expanding properly, preventing the sensors from working properly. Installing a rain sensor outside is the old way of doing things. Sprinkl Conserve, the smart rain sensor, is the new way! It’s installed indoors at your controller. It’s out of the weather and other physical elements, making it virtually maintenance free! It uses your controller’s power source, so it needs no batteries. It also doesn’t require a ladder to install it. So, for those that don’t like heights, you’re in luck! Here’s a link to the installation guide. Sprinkl Conserve also integrates with local weather forecasts and uses predictive scheduling to prevent watering if it’s going to rain. Your old style sensor can’t do that! Another great advantage to having a Sprinkl Conserve smart sensor is the support. If you’re in Frisco, TX, their support team is accessible in person. Whether online, on the phone, or in person, you will receive an amazing customer service experience. Sprinkl Conserve is the only smart sensor on the market that you can manage from your phone. Now is the time to upgrade your old style sensor to the new smart sensor, Choose Sprinkl Conserve and save! THE CONNECTORS: Conversations with visionaries, investors and entrepreneurs from North Texas who are making a mark in the business world. The classic suburban challenge of keeping the lawn green sparked the idea behind Sprinkl, a startup led by Noel Geren. Two years ago, the serial entrepreneur from Frisco launched the company. It makes a smart irrigation device called Conserve that saves water and can sync to a city’s water restrictions and local weather. Geren, Sprinkl’s CEO, co-founded the startup with a friend and former co-worker, Daniel Pruessner, who is the company’s chief technology officer. Conserve can hook up to any sprinkler system and control it with a smartphone app or tablet. This summer, the irrigation device got picked up by Home Depot. Conserve is now sold in Home Depot stores in Texas, California, Florida and New Jersey and on the home improvement store’s website. It’s also sold on Amazon, SmartHome.com and in b8ta, an electronics and tech gadgets store in Palo Alto. The device — which can be tacked onto any sprinkler system — retails for $99. Pruessner and Geren developed the prototype using a modified Easy-Bake Oven and 3-D printer. Now, the devices are manufactured in El Paso. The startup recently raised $300,000 from Ian Woodward-Smith, an angel investor who’s joining Sprinkl’s leadership team, and it got a $1.1 million credit line to develop a new irrigation controller that’s expected to debut next spring or summer. Geren recently spoke about his plans. His answers were edited for brevity and clarity. In the 1980s, I started programming on a Commodore 64, and I really liked creating things. That kind of started everything. In high school, I was building my own apps and games. I knew wanted to work for myself. My dad worked for himself, so I kind of followed in his footsteps with that, but in a totally different vertical. I have a very high level of workmanship, and I’m very detail-oriented. I have high expectations of things. I found myself frustrated when I worked with other people because I thought it could be better, so that was a motivating factor, too. How did you get the idea to start Sprinkl? I met Daniel Pruessner when I was working at [Richardson software company] HRsmart. He was a programmer there. He was interesting because he was a 16-year-old kid, but he was writing code at the same level of everyone there who was out of school or older. Daniel and I stayed in contact after that gig. Daniel went to school for electrical engineering, and I started dabbling in hardware here and there and got really into building devices. Daniel and I were talking about how crappy our sprinkler systems were, and it was during a time with a lot of water restrictions. We decided to build our own device that could handle these shifting water restrictions and dynamic schedules. Daniel and I started off just building the device for ourselves. Tell me how Conserve works. What makes it different from the sprinkler systems already on the market? Conserve works by integrating with the existing sprinkler systems that are on the market. It integrates as a rain sensor. Rain sensors are static — basically when it gets rain, it shuts off the device and when it doesn’t get rain, it lets the sprinklers water. Our device is determined based on formulas and data. We are able to fine-tune when and where and how much water each area would get before it would either shut off the watering or not allow it to water for a period of time. We can go back and look at historical trends. We can look at forecast information. If the chance of rain is 90 percent today, we’re not going to water. Your traditional system would water, and then when the rain sensor gets wet, it would stop the sprinklers from watering, but you might have watered that morning, so you are wasting potentially 200 or 300 gallons of water. What role do you think smart devices like Conserve will play in the future? The connected industry is going to be massive. Everything is going connected: my car, my home. The ways people build their devices for interoperability is going to be key. One thing we’re working on now is if I pull it in my car, my Lexus has apps in it. It would notify my house and say, ‘I’m coming home,’ and turn off my sprinklers if they’re running, so my car doesn’t get wet when I pull in. It could be possible now. It’s just a matter of us partnering with car manufacturers. How did you get a meeting with Home Depot and seal the deal? It was a very unique product for them, not something they’ve seen elsewhere. We got the meeting through our sales guys we brought in. They have experience in retail — one of them was with Target and the other one was with Best Buy, so they know everybody in the industry. We gave the buyer a screwdriver and had her do the install as a demonstration to show it’s solid and it works and it’s user-friendly. That’s probably the quickest way to kill a deal — if you show something that’s not vetted and doesn’t work right. With giving her the screwdriver, everything went flawlessly. She installed it in five minutes. Any other devices you’re dreaming of building? Lots of them. I really want to build a larger version of a water gun that I built. My son and I are working on an Apple Watch-powered rocket launch for shooting model rockets, so you can just shoot them off from your Apple Watch. We’re model rocket enthusiasts. … I’ve got a million and one ideas. We are going to prototype a bug zapper that would calculate and track how large the bugs were that it killed. We have a whole list of ideas that we want to do. A lot of them are more hobbyish than retail-ready. Hometown: Grew up in McKinney, lives in Frisco. Education: Graduated from McKinney High School, took art and computer science classes at Collin College. Family: Married to wife, Jodina, and has a 9-year-old son, Preston, and 2-month-old daughter, Audrey.